The smallest true wireless earbuds deliver clear audio wherever you are. 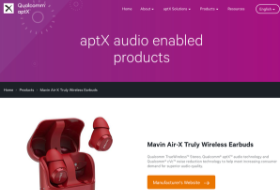 Arcadia, California - Mavin Inc., award-winning makers of wireless and digital audio solutions, today announces Air-X, the first true wireless earbud to last 10-hours with one standalone charge, and up to 50 hours with its included charging case. The brand, winners of the German iF Design Award, the Red Dot Design Award and the CES Innovation Product Design Award, implement Qualcomm’s latest chipset for premium wireless headphones that pack a punch with the high audio output. 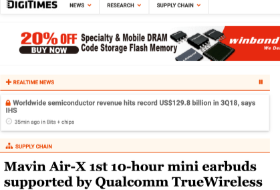 "We are pleased to have worked so closely with Mavin to help them integrate our latest low-power Bluetooth audio SoC into their Air-X earbuds”, said Anthony Murray, Senior Vice President and General Manager, Qualcomm Technologies International, Ltd. “This breakthrough platform combines Qualcomm TrueWireless Stereo, Qualcomm aptX audio and Qualcomm cVc noise reduction technology to help meet increasing consumer demand for superior audio quality, while also supporting significantly extended battery life and playback time." Together with Qualcomm Technologies, Mavin has successfully developed the Air-X, with up to 10 hours of play time (up to 50 hours with pocket-sized charging case, 10 minutes quick charge for 1-hour play time) in a super light-weight design that weighs less than 4.5g per earbud. Air-X also features voice assistant (Siri, Google), call audio in both ears, Qualcomm® cVc™ noise reduction technology and built-in ANC (Active Noise Cancellation, Air-ANC model only, it will be launched in the market on Q1 2019) to support crystal clear voice call quality and premium audio experience to users. 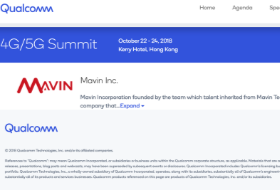 Mavin solves one of the most common problems that consumers encounter with their wireless headsets, earphones and earbuds - the distance and angle of transmission between the playback devices. Its patented antenna design provides a long and wide-range signal reception designed to enable highly reliable wireless connection from pocket-to-ear, and ear-to-ear. Air-X’s ergonomic stabilizer and ear tips secure the earbuds in the ear for comfortable, all day wear. 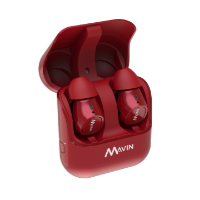 The Mavin Air-X earbuds are powered by the latest Qualcomm low-power Bluetooth Audio SoC, QCC3026, which supports Bluetooth 5 and, Qualcomm® aptX™ audio technology. Air-X implements Qualcomm TrueWireless Stereo Plus, eliminating the need for cross-head Bluetooth transmission by simultaneously connecting the mobile device to both earbuds. When paired with Air-X and the Qualcomm® Snapdragon™ 845 Mobile Platform, Qualcomm TrueWireless Stereo Plus can help reduce power consumption by up to an additional 10%. It supports an even simpler pairing experience when connecting earbuds to the mobile device and helps reduce latency because both buds are connected directly to the smartphone.